Just to let you know I passed my driving test today, thanks to Michael Ackroyd. He was absolutely brilliant, patience & a great teacher. I can't thank him or praise him enough. He's been fab. Ill recommend him to everyone. Thanks so much. 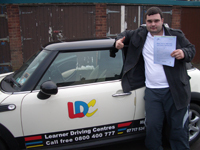 I'm really pleased with the instruction given by Michael, it gave me the confidence to pass my test the first time. He's really patient and explains things very clearly. The lessons were really enjoyable. I'd recommend him to others definitely! None of my family passed their driving test at the first attempt but with Michael's help I did. I found Michael friendly, thorough, professional and patient. I can highly recommend Michael. I just want to say thank you very much for giving me the chance to pass. I wouldn't have been able to do it without your help in the short time that we had.